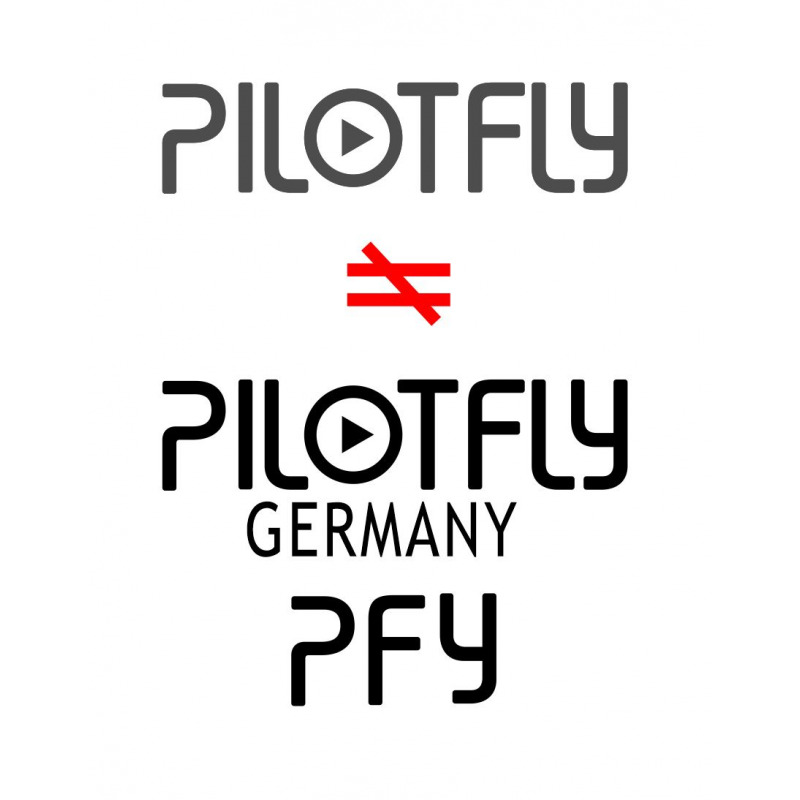 As you may learn from the recent announcement that Pilotfly Germany (or PFY) and Pilotfly Taiwan have now parted our way and seeking to continue service under similar brand name. Although we don’t encourage the ambiguity of trademark and brand name, and we all know that the counterfeiter is just like a shadow, which can only follow the footsteps with inventors but never walk in the forefront. 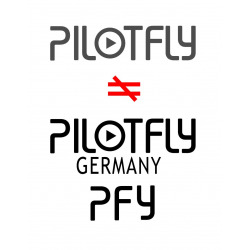 Pilotfly is a Taiwanese brand. In 2013, I started up the company with only 3- person R&D team in my living room. We worked day and night to launch our first product – Funny Go 1. After getting the patent of directly view of lcd screen design, we continually launched C45, Adventurer, and Traveler, as well as the related product lines to provide the best experiences to our customers. 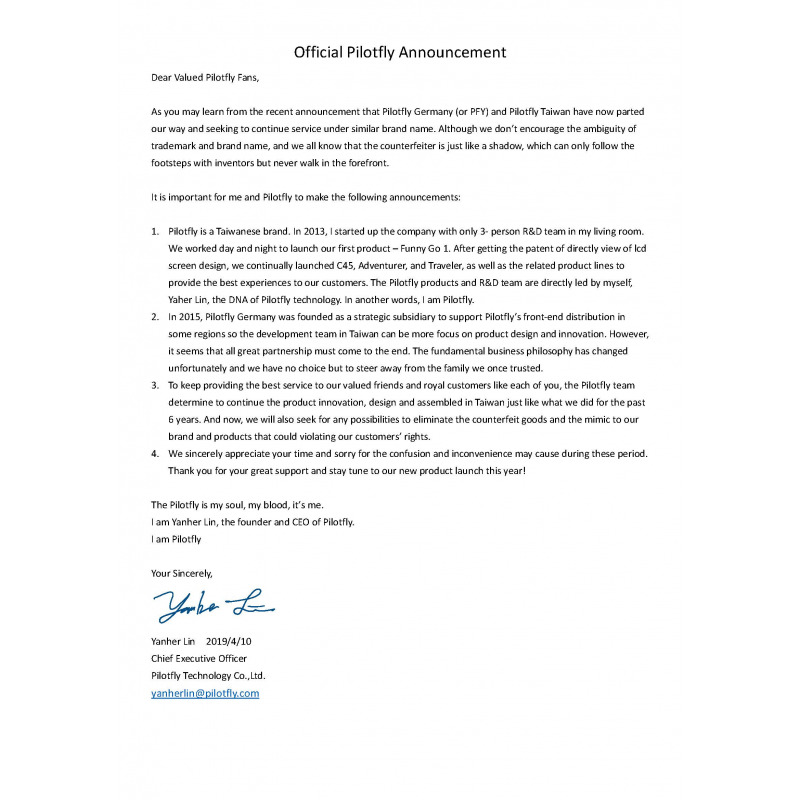 The Pilotfly products and R&D team are directly led by myself, Yaher Lin, the DNA of Pilotfly technology. 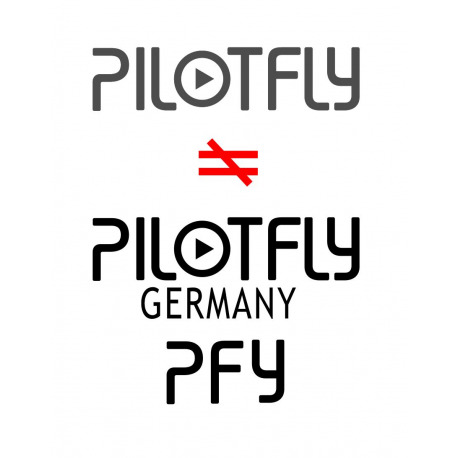 In another words, I am Pilotfly. 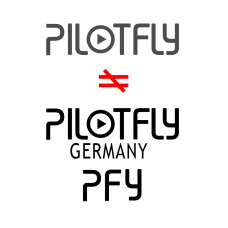 In 2015, Pilotfly Germany was founded as a strategic subsidiary to support Pilotfly’s front-end distribution in some regions so the development team in Taiwan can be more focus on product design and innovation. However, it seems that all great partnership must come to the end. The fundamental business philosophy has changed unfortunately and we have no choice but to steer away from the family we once trusted. To keep providing the best service to our valued friends and royal customers like each of you, the Pilotfly team determine to continue the product innovation, design and assembled in Taiwan just like what we did for the past 6 years. And now, we will also seek for any possibilities to eliminate the counterfeit goods and the mimic to our brand and products that could violating our customers’ rights. 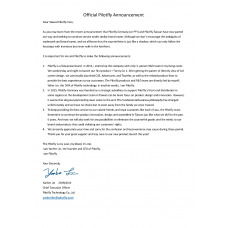 We sincerely appreciate your time and sorry for the confusion and inconvenience may cause during these period. Thank you for your great support and stay tune to our new product launch this year! The Pilotfly is my soul, my blood, it’s me. I am Yanher Lin, the founder and CEO of Pilotfly.